The countdown is on to our open day on Saturday 1st September, we look forward to welcoming you from 1pm for an afternoon of activities, stalls, displays & refreshments………all funds raised will go to the Meal-a-Day charity. You’ll find full details here, this includes the colouring competition download and search for the oldest Bible! This entry was posted in Local Community, Our Charities, Our Events, Our Preaching on August 8, 2018 by admin. 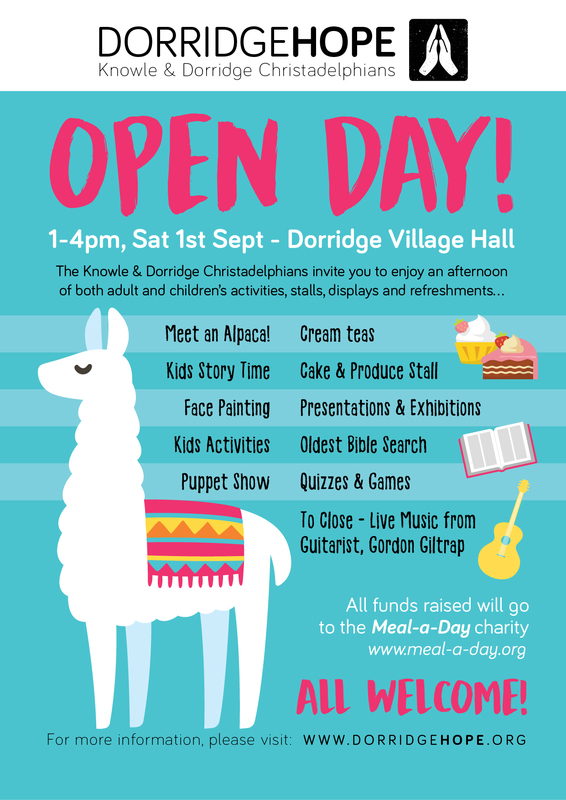 The Knowle & Dorridge Christadelphians are delighted to invite you to enjoy an afternoon of activities, stalls, displays & refreshments………all funds raised will go to the Meal-a-Day charity. This entry was posted in Local Community, Our Charities, Our Events, Our Preaching on July 21, 2018 by admin. ……..the Bible Learning Centre is too! Young volunteers from across the country will be joining the BLC team during the week commencing August 5th to take the BLC out into Solihull Town Centre and Malvern Park. 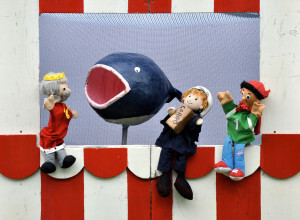 Activities for youngsters will include a puppet show featuring Bible stories about Noah, Jonah and the Good Samaritan, face painting and other activities, with balloons and other giveaways for children. For adults there will be free copies of the Gospel of Luke, pens and bookmarks and a special survey designed to test public awareness of the Bible Learning Centre’s role. Available from John Botten, Bible Learning Centre publicity co-ordinator on 0121 705 0646 or 07958 389378.The Centre is run by the Christadelphians in South Birmingham, and funded by Christadelphian congregations committed to promoting Bible-based Christianity. This entry was posted in Local Community, Our Charities, Our Events, Our Preaching on July 26, 2013 by admin. Knowle and Dorridge Christadelphians welcomed a large number of people to their Open Day last Sunday. Over 200 cream teas were served as visitors enjoyed the pleasantly warm afternoon buying cakes, plants, second hand books and other Bible reference books, taking rides on the miniature steam railway, watching an enthralling series of puppet shows retelling Bible stories, playing volleyball and boules and listening to live music from a group of young members. Donations to the Meal a Day fund amounted to £642, which will be greatly appreciated by the charity which helps the hungry. 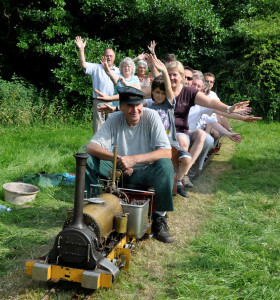 The photo shows the volunteer helpers enjoying a well-deserved train ride at the end of the afternoon. This entry was posted in Local Community, Our Charities, Our Events, Our Preaching on July 23, 2013 by admin. Meal a Day supports sustainable social development projects in some of the poorest countries in the world. It is presently working in Africa, Asia, Eastern Europe and South America. Meal a Day works primarily with grass roots, locally run projects to overcome the problems of hunger, disease, disability, destitution and homelessness. You can download the spring 2013 newsletter here or for more information on Meal A Day click here. This entry was posted in Our Charities on May 8, 2013 by admin. “If you are practically minded Shunem needs your help” was the statement in the Spring 2012 newsletter of the Shunem Home sent out to ecclesias. Shunem is a home set up and run by Christadelphians, near Hyderabad in India. That started the idea of going out to India as both of us (Paul and Shirley) have spent many years on various practical projects over the years and really enjoy working with our hands. So there it was an ideal project in an exciting location, seed planted!! Ever since our oldest Daughter returned from her Shunem experience over 4 years ago, Shunem and India have held a fascination for us both as we heard accounts of a place so different from our own but importantly a extension of our spiritual family so this opportunity was not to be missed. The home mostly looks after children whose parents have leprosy so the children are unable to live at home, but also has some elderly residents too. Leprosy is a bacterial infection that affects the nervous system and can cause severe damage to the body. Faces, hands and feet all show the damage as a result of leprosy and therefore people can recognise a person who has suffered leprosy very easily. There is a strong social stigma connected with this type of leprosy in India leading to them being disowned by their family and most cannot find a good job. Coupled with that children of these patients would also grow up to develop leprosy and so the cycle of suffering, unemployment and poverty would continue without the intervention of places like Shunem. We were privileged to be part of a great team of Christadelphians drawn from across the UK who worked with such enthusiasm in temperatures that were at times almost unbearable! But we were also able to enjoy fantastic fellowship and new experiences together. By working together we gained a real sense of achievement as the work was completed. Working in the girl’s dormitory, cleaning, scrubbing and painting in extremely warm conditions was exhausting but the look of delight on the girl’s faces made it all worthwhile and is one of my lasting memories. Teamwork made even the most unpleasant job fun! The storeroom was pretty grim and once the rats had been chased out we got to work transforming the room. Despite being on our knees scraping the floor of years of grime we managed to see the funny side of it and felt a real sense of achievement as we watched Jenni who runs the home, replacing all her ­­­­­­­­­­­ingredients in a spotless storeroom, although the unfortunate gecko who was found stuck to the floor was less impressed!! The need to be practical was essential, the tasks we took on ranged from the more technical jobs such as arranging for the construction of replacement concrete ramps and building new partition doors to divide up a large room through to painting and decorating. One of the lovely aspects of working at Shunem was the sheer enthusiasm of the children eager to help. Even if sometimes we had to reign in their keenness rescuing the occasional brush or roller or replacing the hammer with a screwdriver to fix a screw! They were such hard workers and so determined to finish the work. The hard work of the Shunem staff was so appreciated by all the team, despite a few misgivings about curry every day! Jenni and her staff pulled out the stops to produce lovely “westernised” food to suit our delicate palates! But palates adjusted and we all enjoyed to a greater or lesser extent the wonderful spices on offer even if curry for breakfast was only for the very brave!! It was great too, to be able to relax and take a few minutes out to talk to the elderly residents, children or staff, leading the readings or summarising a Bible reading as a thought for the day for the children. One of my abiding memories is of an elderly Brother sitting outside his room each morning Bible in hand surely a lesson for us all. The children are of course a what makes Shunem such a special place; it is difficult to get to know them all in such a short space of time but their enthusiasm for such simple pleasures, such as pots of bubbles brought by one of the other volunteers was infectious. It is also difficult to compare life styles of our children and we only had a very small snapshot of their lives but contentment with what they are able to share at Shunem does seem very evident. Despite the early April temperatures of 42’+, it was a very exhausting, but greatly rewarding made all the more enjoyable by being able to fellowship with so many and recognising the pleasure the projects were bringing to the residents and staff. This entry was posted in Our Charities on April 29, 2013 by admin.